The Whisky Nosing & Tasting Evenings starts for the summer season on the 6tht July and we have a great programme lined up. So if you're visiting Dufftown plan to be here on a Wednesday at 8pm. Held at the Commercial Hotel Back Hall, the entrance fee is GBP12 and includes a tasting glass for you to keep. Jenna Collins, Visitor Centre Supervisor of The Glenlivet brought along a great selection of single malts for tonight's tasting. The new Founders Reserve, 2 Nadurra's Oloroso & First Fill Bourbon and a 1983 "Cellar Collection" French Oak bottling. 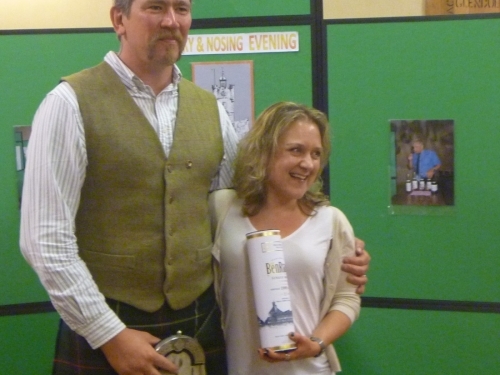 The winners after a "nose-off" were our local Colin Mackenzie and Gail Anderson from the USA here receiving from Jenna. 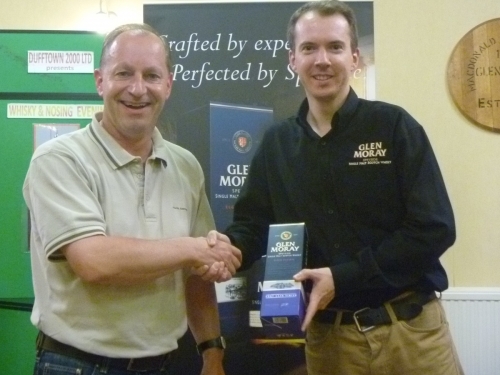 Iain Allen from Glen Moray distillery helped us out with a second Nosing & Tasting this year. He brought with him the GM Classic, Portwood finish, a Peated GM, the 10yo Chardonnay finish and a great 16yo. The winner of the competition was a surprised Frank Honer from Germany who was presented with a bottle of GM Port wood from Iain. Iain also donated Glen Moray Parker pens and Tasting notebook to each of the participants. Very generous, thank very much for that indeed. Denny Mac T & Jennifer Proctor who work in the Visitors Centre brought along a great selection from Dufftown's Glenfiddich distillery. 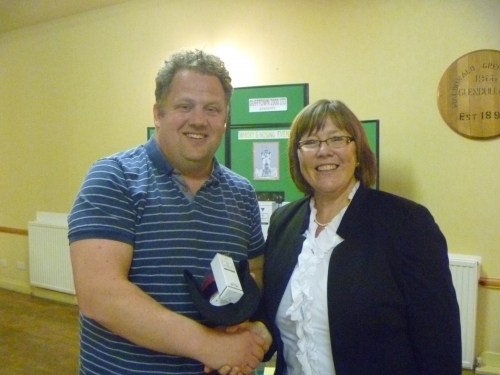 It was great to see that someone local won the Nosing competition too. Steve Alan is shown here presented a bottle of GF 18yo by Denny. On 19th July Calum, the Warehouse Manager of BenRiach introduced a great selection of single malts including the new 10yo, 16yo, PX 15yo, Solstice 17yo and the heavy peated Septendecim. 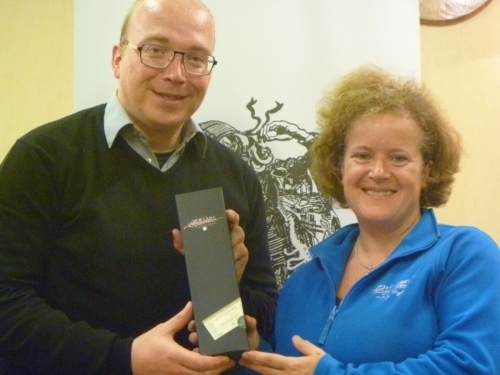 A new record of participants enjoyed the single malts and the winner from England was Suzanne Aitken shown here receiving a bottle of BenRiach 13yo Virgin Oak from Calum. On 15th July we had a selection of single malts supplied by Diageo from Cragganmore, Knockando and the three new Dufftown whiskies. 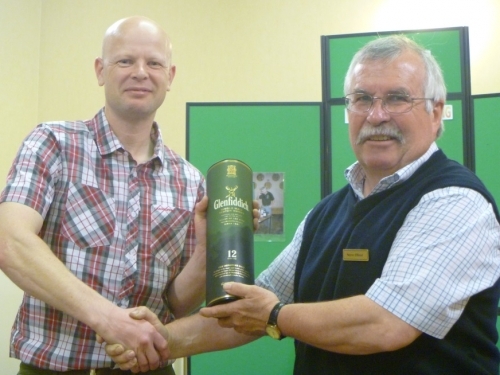 20+ people attended the nosing & tasting and the winner was Denny MacTaggert from Dufftown, here receiving a bottle of Cragganmore from Steve Oliver. 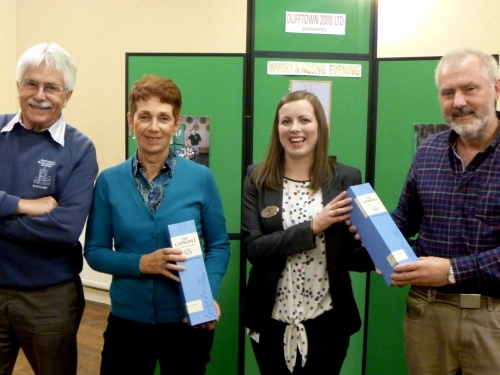 The first official N&T of 2015 was presented by Antonia Bruce of the Adelphi Distillery in Ardnamurchan. Antonia brought along a superb selection of great single casks malts, notably; 24yo Bladnoch, 22yo Longmorn, 19yo Glen Grant and 17yo BenRinnes. A large audience enjoyed these great drams and the winner of the Nosing Competition was Denny McTaggert, a newly appointed distillery guide from one of the Speyside distilleries. 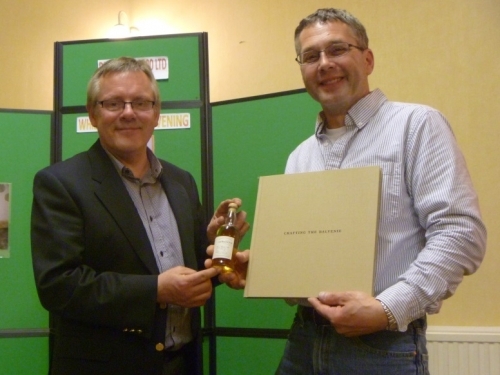 Denny is shown here receiving this year's Spirit of Speyside Whisky Competition winning bottling from Antonia. May is Whisky Month so we decided to kick-off early this year with a Balvenie N&T presented by David Mair, Brand Ambassador. The event took place on 13th May in the Commercial Hotel Hall. 17 whisky enthusiasts from Europe, South Africa and the USA enjoyed the Tasting which included the Double-Wood 12yo, Single Barrel 12yo, Caribbean Cask 14yo, Double-Wood 17yo, & Port-Wood 21yo. 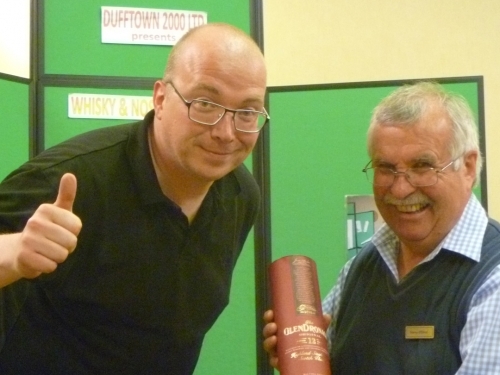 The winner from the USA, Larry Loney is shown below receiving a cask-strength bottle of single malt and a History of Balvenie book from David. 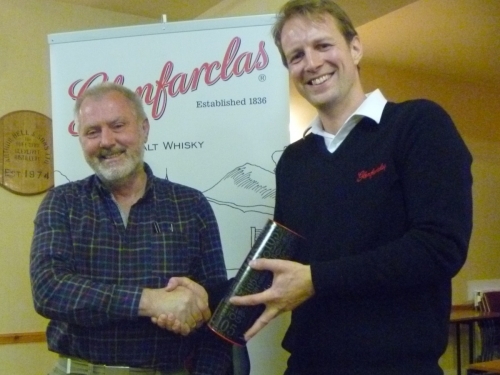 Matthew Porritt from New Zealand performed his first presentation of Glenfarclas. Newly arrived Matt did a splendid job in presenting 4 great malts from the distillery in a professional manner, talking about the distilling process and the generations of the Grant Family. 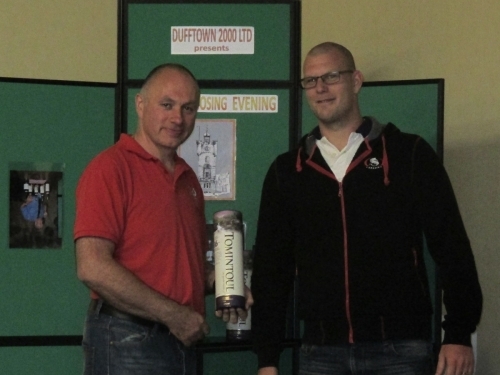 The audience loved every minute that evening and the winner was Colin MacKenzie from Dufftown. He was a real gentleman in giving his prize to the (lady) runner-up on his table who came from Sweden. Very generous of him! Gemma Porter, head Tour guide at the William Grant distilleries, introduced 5 great malt whiskies of Balvenie; 12yo Double Wood, 12 & 15 yo Single Cask, 14yo Caribbean Cask and 21 Port Wood which the evening's favourite. 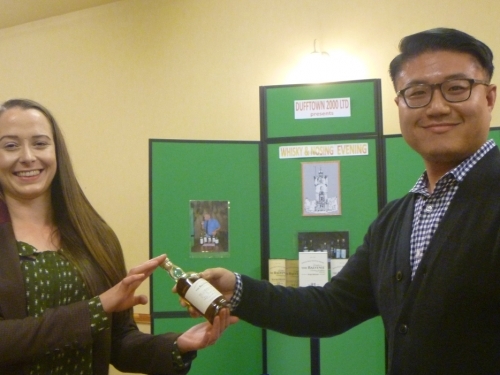 We had a full house and the only person who had all 5 correct at the Nosing competition was Jeffrey Oh from New York here being presented a sherry wood cask sample from Gemma. ~ ~ ~ After 17 Nosings and Tasting in 2015, Dufftown 2000 Ltd, would like to thank all the distilleries for the support, product and time in giving the visitors to Dufftown the opportunity to taste some of Scotland's whiskies. Mike Patterson, Sales Executive of Gordon & MacPhail presented a selection of great whiskies to the audience who came from as far so Japan & New Zealand. He brought along the new 15yo Balmenach and other core range single malts. Mike did a short speech about the owners of the company and the distillery after which we had a great tasting. 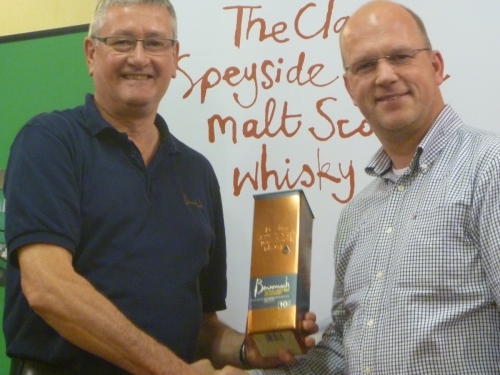 The winner of the nosing competition was Peter Struyk from the Netherlands who won a Benromach 10yo presented the bottle by Mike. 20 plus people attended the Tomintoul tasting which was presented by Andrew Sim. Andrew brought along Tomintoul 10yo, 16yo, Portwood, Oloroso and Old Ballantruan at 50% ABV. The winner of the competition was Daniel Nicklasson from Sweden here being presented with a bottle of 16yo by Andrew. The GlenRothes selection was presented by Steve Oliver. The selection was welcomed by a near full house of people from as far as the USA & Canada. The winner from America was Nuyla Nolan who won a bottle of GR Select Reserve here shown with Steve. Denny does it again during the GlenDronach Nosing & Tasting. Dufftown 2000 Ltd. presented a selection of the GlenDronach Distillery range. The winner after a "Nose-Off" was Denny Mac Taggert here receiving a bottle of GlenDronach from our presentor Steve Oliver. Diageo Distillers supplied us with a great selection of from their Cardhu portfolio of single malts. A large audience enjoyed the Cardhu 12, 15 & 18 yo and the Special Cask and Amber Rock whiskies. 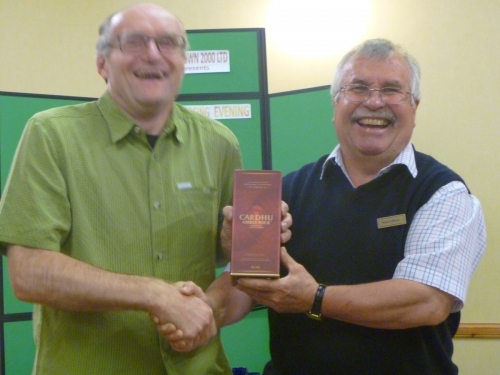 The winner Georg G. from Switzerland was a surprised winner of the nosing competition receiving a bottle of Cardhu Amber Rock from our compere Steve Oliver. 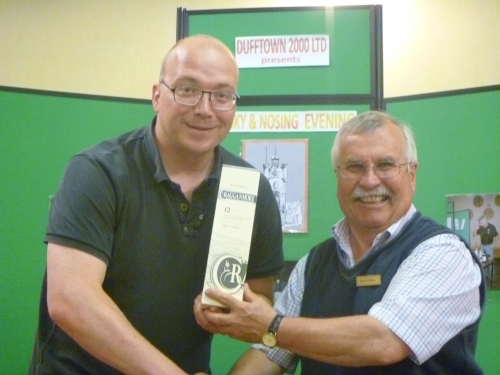 Dufftown 2000 Ltd. organised a special Nosing & Tasting evening for local accommodation providers on 24th June. The single malts supplied came from all over Scotland. This was to give them an idea of how D2K entertains visitors from all over the world on Wednesday evenings in the town. 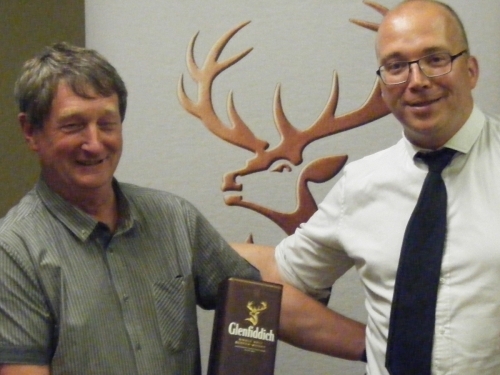 We had a good number of people attending and the winner of the Nosing Competition was Alistair Jeffs from the Highland Spirit B&B, here presented with a bottle of Glenfiddich by Steve Oliver of Bluefold Cottages. Margaret Gray, the Macallan Brand Education Presenter introduced 4 single malts from the 1824 Range. The Hall was fully booked with 33 people from as far as China, Philippines and Australia. Margaret explained to the audience the reasons why Macallan moved away from using aged bottlings. 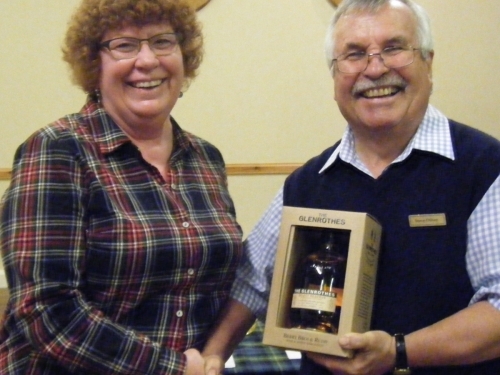 The Gold, Amber, Sienna and Ruby malts were well received and the winner after a "nose-off" competition was Marcus Salter from Dufftown, on his first visit to a tasting session, seen here receiving his prizes from Margaret. A small but dedicated group of whisky enthusiasts took part in this Nosing & Tasting. 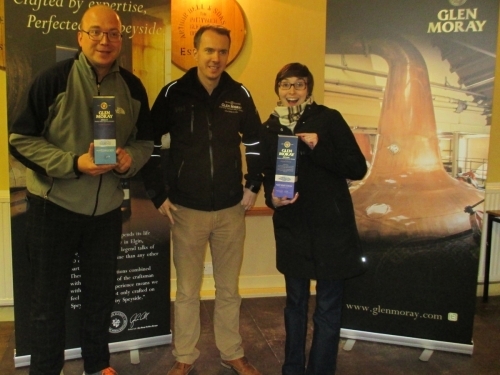 Iain Allen and Emma represented Glen Moray with a selection of 4 single malts from their core range. The winner of the evening was Aislinn Ritchie from Canada shown here with the runner-up Denny McTaggart receiving their prizes from Iain.